Home » Why Choose Sous Vide Cooking Systems? 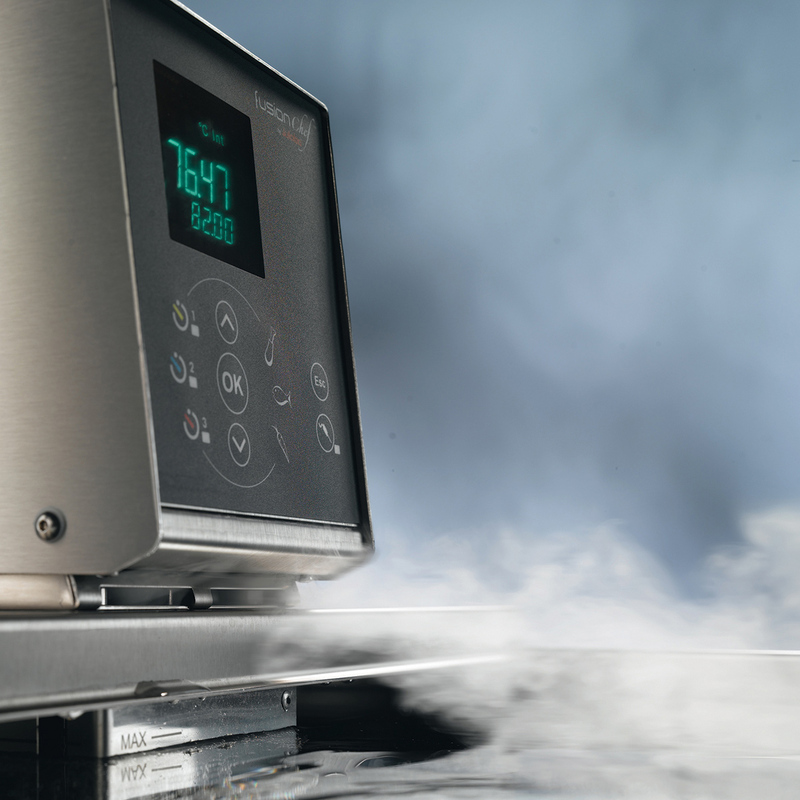 Foodservice operators from many segments have turned to sous vide to produce foods with superlative flavor, tenderness and consistency while solving a number of their operational problems. “Sous vide” means “under vacuum,” and that’s the heart of the system: cooking food portions in bags from which air has been forced out. The packets of meats, fish, vegetables or other foods cook and pasteurize in a constantly circulating warm-water bath at a lower temperature and for a longer time than in other methods. Salt, seasonings and sometimes oil are put right into the bag with the other ingredients, forcing their intense flavors into the food. If employees don't serve the food immediately, they can chill the bag of cooked food in an ice-and-water bath before refrigeration. Because these chilled bags can be stored in a refrigerator for 48 hours or more, sous vide allows operations to shift production labor to earlier in the day or week, or cook consistent batches in a centralized commissary to send out to multiple locations. When it’s time for service, staff can quickly retherm cooked proteins and sides in a warm bath and then plate and garnish them. 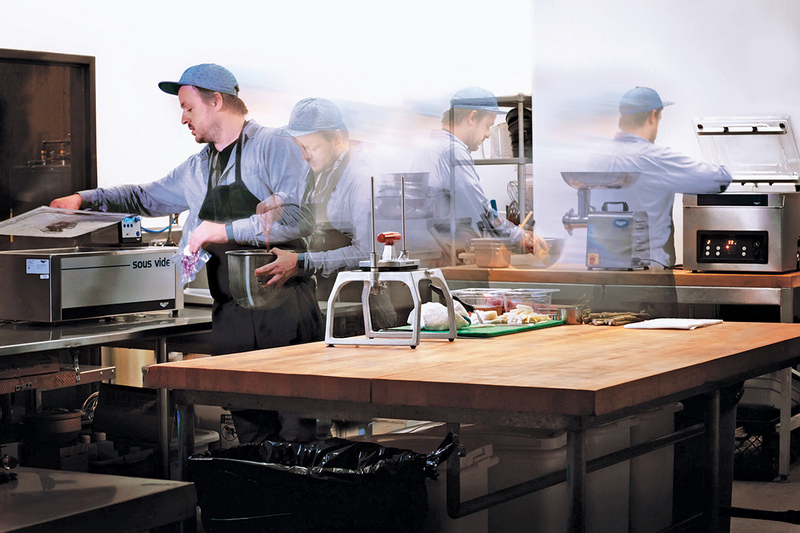 Sous vide cooking can help operators with a variety of needs and challenges. A fast-casual Mexican concept can slow-cook pulled chicken, pulled pork and carne asada in bulk, then assemble tacos to order at meal times. A wedding caterer can pack a tank and immersion circulator to take to the reception site, then assemble plates of precooked and rethermalized beef, chicken or fish for a few dozen or a few hundred guests. A hospital or nursing home can be assured that meals are flavorful, nutritious, consistent and free of external pathogens; plus codes on bags help ensure that the right foods get to those with special diets. While sous vide in its simplest form involves nothing more than plastic freezer bags, a pot, a stove burner and an immersible thermometer, dedicated precision equipment has made it much easier. Immersion circulators that drop into a dedicated sous vide tank constantly heat and agitate the water bath, maintaining even temperature within half a degree or less. At least one manufacturer offers a basin with a built-in thermal circulator instead of a separate, drop-in immersion circulator. Many companies that sell immersion circulators also supply stainless, aluminum or polycarbonate tanks, and many have a full system including the heat-rated boilable bags, a vacuum bag sealer and tape or label printers to identify or color-code the contents of each packet. The latest technology also makes HACCP compliance easier. Some immersion circulators record time-and-temperature data and even generate HACCP reports. To document core temperature for HACCP tracking, employees can insert optional probes into food bags without breaking the vacuum (first applying a patch of a special foam tape where they plan to insert the probe). The probe attaches to a data logger or the immersion circulator itself. Using multiple probes, staff also can simultaneously heat different foods with various cook times. 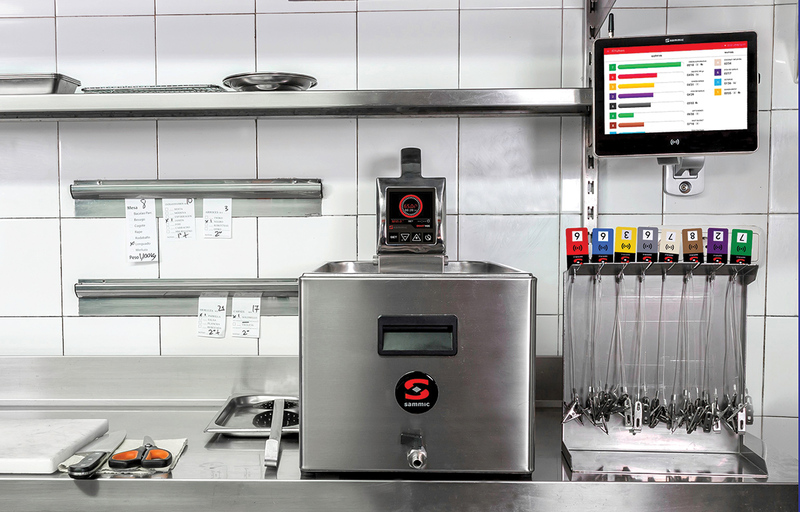 One manufacturer has introduced an RFID feature to the sous vide cooking process. It helps operators better manage individual bags with different cook times in one water bath, for example. Instead of marking bags or using a multi-timer, you clip the RFID tag onto the bag, scan it with the RFID reader, then drop it into the water bath. The RFID reader uploads the data to a tablet. Anyone monitoring the bags in the kitchen can check the tablet and know when a product has finished its cook time and pull it from the water bath. Follow these tips when specifying immersion circulators and tanks. Choose the right size for your needs. 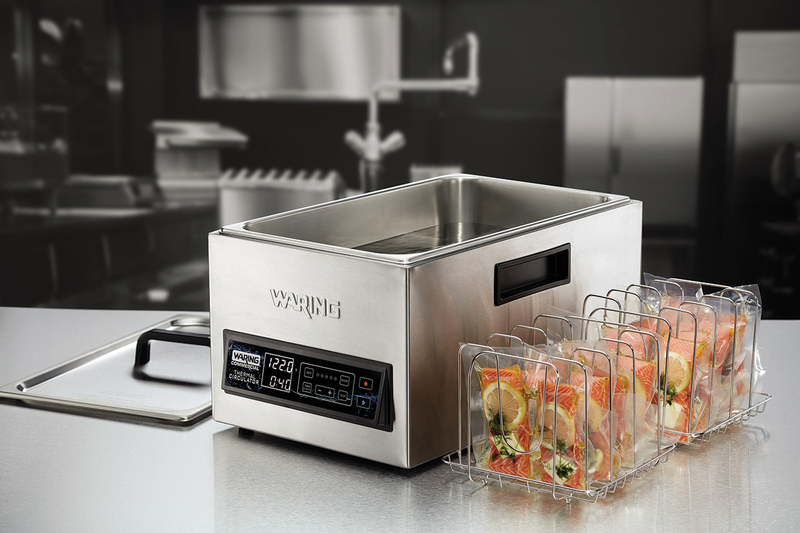 Foodservice operations typically need an immersion circulator that uses 1 kW or more of electrical power. Tanks appropriate for foodservice range from about 3.4 gal. to 15.3 gal. ; smaller units may be portable, while larger ones should be for a regular cooking station. Make sure the immersion circulator is the right size for the tank. A too-powerful unit will agitate the water excessively, while a too-small circulator will not heat water consistently throughout the tank. Evaluate the level of programmability. Immersion circulators range from fully manual (cooks can set the time and temperature for each recipe) to dozens of pre-sets plus customizable programs. Some allow employees to download data from the immersion circulator to print labels for the food bags. Think about accessories. Some tanks come with a rack to properly position the food bags for efficient water circulation. One or more probes will allow employees to directly track core temperatures of foods. Waring’s Sous Vide Thermal Circulators have the circulation feature built into the basin. Look for independent certification, such as NSF. At least one manufacturer offers an immersion circulator with NSF certification; another company offers it on its water tank and cover. Take durability into account. This is a factor in the price of both the immersion circulator and the tank and how heavily employees will use the equipment. Choose from a number of materals and price levels for the water tank, from polycarbonate to heavy-duty dual-walled steel tanks. Consider energy costs. A tight-fitting lid on the tank helps conserve heat. Double-wall steel tanks hold heat better. Ask about the warranty and repair options. Some manufacturers ship parts or send an authorized service agent to the foodservice site; others require operators to return the immersion circulator or tank to the factory, leading to substantial downtime. For more on warranties, see “What To Know About Warranties” on pg. 42. Consider the company’s product line and how long it’s been supplying sous vide equipment. A number of suppliers tout their complete solution, including the core equipment along with vacuum bag sealers, bags and other supplies. Some companies have been in the sous vide business for years and have extensive documentation and chef expertise. The success of Starbucks’ popular Sous Vide Egg Bites has restaurants of all sizes touting this cooking preparation as a differentiator. In February, Danny Meyer’s chain, better known for burgers, made headlines with the nationwide rollout of its Chick’n Bites. Calling out the sous vide cooking “for optimum flavor, moisture and texture” sets Shake Shack’s apart from chicken nuggets on other fast-food menus. This self-described “virtual food hall” actually is a brick-and-mortar eating space serving five different menus—on which all the dishes are cooked sous vide. Customers order at centralized kiosks. The variety of offerings—including Latin-, Mediterranean- or barbecue-style rice, grain and salad bowls topped with sous vide-prepared meats—shows the diversity of cooking that thermal circulators allow. In announcing its franchise expansion plans last year, this chain pointed to its partnership with a menu developer specializing in sous vide techniques to ensure consistency and quality control of its menu items, including its signature shawarma. Sous vide preparation is the hook at this new fast-casual “better chicken sandwich” spot from Eli’s Restaurant Group. Roost boasts on its website that its chicken is delivered fresh and then cooked vacuum sealed in a water bath at a precise temperature “so that we consistently produce a perfectly tender and juicy piece of chicken.” The chicken is offered in six different sandwich options, including K-Pop Chicken (featuring Korean fried chicken) and Carolina Buffalo (with fried chicken, Buffalo sauce, bleu cheese and celery slaw).